Lessons from Leaders is designed to connect the region's young professionals with business leaders to offer professional development, career growth and networking opportunities. We are happy to announce Mayor Treney Tweedy will be the event speaker. Mayor Tweedy is a native citizen of Lynchburg. She grew up in Rivermont and is a graduate of E.C. Glass High School. She earned a Bachelor’s Degree in English from Lynchburg College. Mayor Tweedy's career experience includes working for both public and private businesses, as well as higher education in the Lynchburg community. She is a U.S. Navy veteran. 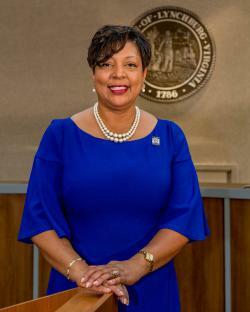 She has served on city council since 2014 and was appointed Mayor in 2018. Cost to attend is $25 and includes lunch. Space is limited. Please RSVP by Tuesday, April 30 by emailing info@lynchburgregion.org, calling (434) 845-5966. Parking is available in City Lot R (351 Court Street).